Sarah O Donnell makes installations that immerse the viewer in a space created with projected light and images. Due to the universally recognizable imagery of these spaces, (a sea-side village, a desert landscape) the installations seem to pivot between the personal memory of a place and the collective memory gained through cultural representation of a place. 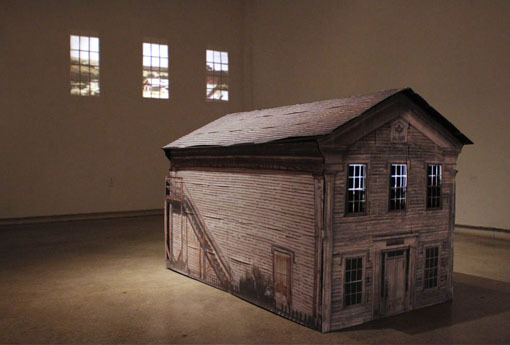 Her narrative films and videos operate in contrast to these immersive spaces, and the glimpses into the minute happenings of unfamiliar characters are similar to the experience of overhearing the conversation of a stranger, or walking past a house at night where the family’s activities are visible inside. The artist earned her BFA from the Tyler School of Art in Philadelphia and an MFA from Ohio State University. She has exhibited her work in venues such as Burlington City Arts in Burlington, VT, the Urban Art Space in Columbus, OH, the Institute of Contemporary Art in Philadelphia, PA as well as several alternative gallery spaces and performance venues in the Philadelphia and Baltimore areas. Her short films have screened at the Philadelphia and Harrisburg Independent Film Festivals.